30 years, 4 months, 9 days old age. Tim Southee will turn 31 on 11 December, 2019. Only 7 months, 20 days, 22 hours, 14 minutes has left for his next birthday. Tim Southee has celebrated the total number of 30 birthdays till date. See the analysis by days count and bar graph. 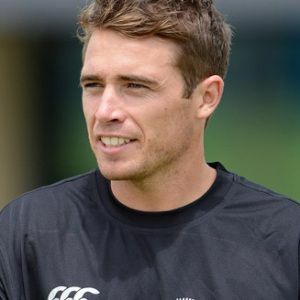 Tim Southee was born on 11-12-1988 in Whangarei, Northland, New Zealand. He is a New Zealand Cricket Player. It was a debut that gave a clear indication of the career to come. Over the next decade or so, Southee would go on to form one of the world's best new-ball partnerships with Trent Boult, and would also come to be known for his ability to clear the fence. He hit his 50th six in only his 36th Test. Pace and outswing, however, are the main tools of Southee's trade. His bag of 18 wickets at 17.33 in the 2011 World Cup prompted Allan Donald to say he had the potential to become the best swing bowler in the world, and though frequent injury-forced absences have kept him from fulfilling that prophecy, he has shown he can be devastating across a wide range of conditions. In ODIs, his landmark performance came at the 2015 World Cup, when he sliced through England's batting with a sensational spell of swing bowling to finish with figures of 7 for 33, the best bowling figures for a New Zealander in ODIs. He though hasn't played much cricket after the 2015 World Cup. Dip in form and a spat of injuries are the main reasons for it. He though has been in and out of the ODI team but has featured regularly for his national team in Tests. He has also been a consistent figure for RCB in Indian Premier League. His form in IPL 2019 will decide his fate for the 2019 ICC World Cup. He was born to Murray Southee and Joanne Southee. He has a sister named Jane Southee and a brother named Mark Southee. He is married to Brya Fahy and together the couple has a son named Cooper Southee. He used to play Rugby during his school days. He has played 2 U-19 World Cups for New Zealand. Southee is one of the best tail-ender in recent years. He has scored over 1500 runs in Test matches and that too with a strike of nearly 90. He once gave away 105 runs in an ODI against India.